Swimming, shelling, boating, fishing, diving, kayaking, surfing, eco-tours, jet ski rentals and parasailing are just a few of the many outdoor activities our pristine beaches offer. But if you are looking to relax, nothing beats an umbrella, a lounge chair and a good book on the sugar-white sands of Mexico Beach. Mexico Beach is a nature lover’s paradise. Numerous species of birds call Mexico Beach their home, including bald eagles, osprey, pelicans, and many species of herons and egrets. Five species of sea turtles inhabit our area: loggerhead, green, leatherback, Kemp’s ridley, and hawksbill. Loggerhead turtle hatchlings emerge in the late summer. Dolphins dive through the waves all year long, and it’s not uncommon to see pods of dolphins playing and feeding in local waters. Sea turtles, urchins, starfish, crabs, and sand dollars thrive here as well. Looking for that perfect souvenir, a unique piece of artwork, antiques, or fine clothing? Come explore Mexico Beach’s eclectic collection of locally owned shops and boutiques. For the sports enthusiasts, St. Joseph Bay Golf Club, just to the east of Port St. Joe, offers 18 holes of challenging play. Drop by the Mexico Beach Welcome Center for a complete list of area golf courses. Events and festivities occur throughout the year in Mexico Beach and include our annual Fourth of July Best Blast on the Beach, Beach Blast Triathlons, Music in the Park, Art & Wine Festival, Gumbo Cook-Off, Christmas Celebration of Lights, and our New Year’s Eve festivities. One of the many great things about our little town is its location. Fresh seafood, a smooth cocktail, or live entertainment, Mexico Beach is the place to be! 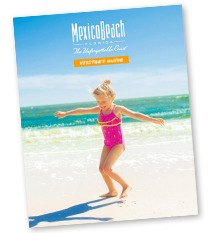 Mexico Beach offers nature lovers a diverse and unique experience. The fishing in Mexico Beach is as good as it gets. Several colorful shops dot the roadside as Highway 98 curves through Mexico Beach. With the clear, warm waters of the Gulf of Mexico, Mexico Beach is a paradise for water sports of all kinds.